Demons did a number on Ol’ Pete. The right-hander put together a Hall of Fame career, anyway. 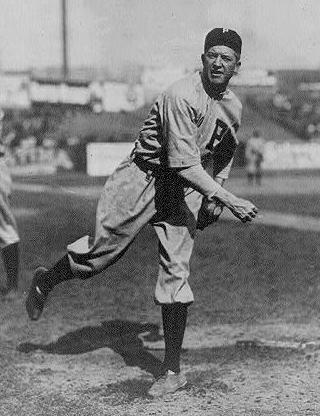 Grover Cleveland Alexander (nicknamed “Ol’ Pete,” “Old Pete,” or just plain “Pete”) compiled a 373-208 won-loss record with a 2.56 ERA (135 ERA+) over 20 seasons of work. He won at least 30 games three times, led the National League in strikeouts six times and topped it in ERA five times. He ranks third all-time in wins and second in shutouts (90). Pete battled booze for most of his adult life. His epilepsy made things worse. World War I left him with shell shock. Supposedly, in his later years, he went around half-broke, relying on the kindness of friends and his ex-wife. The future great, born Feb. 26, 1887, grew up on the Nebraska plains. Shucking corn all day developed his wrists, supposedly, making his curveball all the better. He began playing baseball early, first sandlot stuff and then with the pros. The Philadelphia Phillies bought Pete from the Syracuse Stars of the Class D New York State League for $750. Stardom came fast for Ol’ Pete. He enjoyed an auspicious 1911 rookie season in Philadelphia, going 28-13 with a 2.57 ERA (133 ERA+). Pete led the N.L. in innings pitched (367), complete games (31) and shutouts (seven). Following a 19-17 campaign in 1912 and a 22-8 effort in 1913, Pete really got on a roll. He won 121 games over the next four years and led the N.L. in numerous categories. During his eight-year career in Philly, Alexander went 190-91 (.676 winning percentage) with a 2.18 ERA (140 ERA+). He did all this while pitching his home games at the cozy Baker Bowl. Then, the shooting started. World War I broke out in Europe on July 28, 1914. U.S. Congress declared war April 6, 1917., shortly after a German U-boat sank the British liner RMS Lusitania, with 128 Americans among the dead. Philadelphia, fearing that Pete might be drafted, traded their ace to the Chicago Cubs. (Phillies owner William Baker later clarified that story: “I needed the money.”) Ol’ Pete went 2-1 in Chicago before the Selective Service came calling. Sgt. Alexander shipped out with the Army on June 28 from New York. Soldiers told terrible tales about their service in the Great War. Pete had his own stories. He pulled the lanyard on howitzers directed at the enemy. The constant noise, along with some shrapnel that bit into an ear, ruined his hearing. Pulling that lanyard all day for months also damaged his right arm. German mustard gas poured onto many troops, including Pete. That exposure may have triggered his epilepsy. He came home, suffering from shell shock for some time and seizures for the rest of his life. The drinking, always more than social, got much worse. Pete came back to baseball in 1919. He topped the league in ERA that year (1.72) and the next (1.91). He even won 27 games in 1920 and led the N.L. in strikeouts (173). The live-ball era soon took a toll on Ol’ Pete’s stats, though, like it did with most other pitchers. From 1921 through his final season of 1930, Alexander typically posted an ERA above 3.00. The Cubs, finally tired of Pete’s booze binges, traded him to the St. Louis Cardinals in June of 1926. Alexander went 9-7 with a 2.91 ERA (134 ERA+) the rest of the way. He did his best work in the World Series, against the New York Yankees. There, he hurled complete-game victories in games 2 and 6. He struck out Tony Lazzeri as a reliever in the seventh inning of Game 7, with the bases loaded. Pete enjoyed one more big year in baseball, with the 1927 Cardinals (21-10, 2.52 ERA). Back as a Phillie in 1930, he sputtered to an 0-3 mark before being released. Post-retirement, Pete barely held things together. He tried to quit drinking; nothing worked. Serious epileptic seizures plagued him. The Hall of Fame invited him into its ranks in 1938. A baseball pension and $50 a month from the Cardinals kept him going. The former superstar died Nov. 4, 1950, at the age of 63. The death certificate said it was heart failure. Pete’s ex-wife, Amy, was sure it was a fall from one of those seizures.